"With North Cascades Fly Fishing, you'll find the perfect balance between serious fishing and serious fun." Come visit the pristine Methow Valley in Eastern Washington for your ultimate fly fishing experience. With North Cascades Fly Fishing, you will find the perfect balance between serious fishing and serious fun. 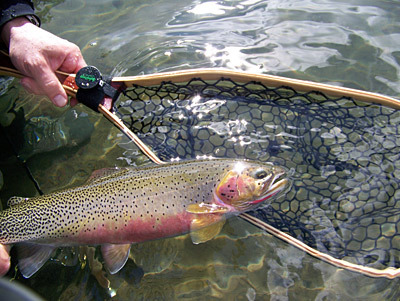 The crystal clear Methow River is a catch and release fishery with plenty of beautiful Rainbow and Cutthroat Trout. With our 14 foot inflatable, self-bailing raft and top of the line fishing frame, you will be floating in style. Both cushioned seats swivel, allowing a cast to every riffle, rock and shoreline in a relaxed fashion. A stable casting platform and thigh bar provide the opportunity for fast action angling. Your experienced guides will assist you in everything, from choosing and changing flies to setting out your gourmet lunch, and everything in between.